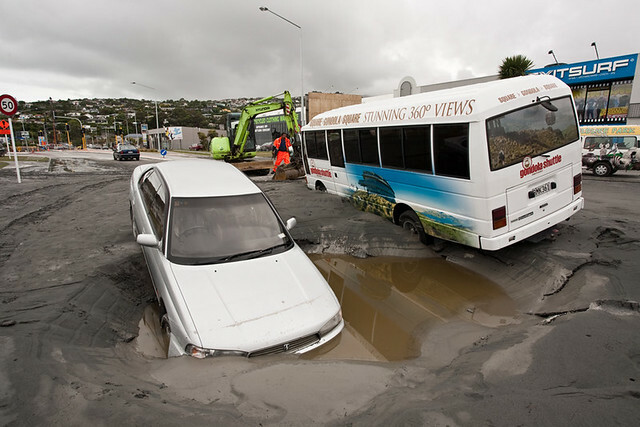 Ferry Road Christchuch – Cars and buses litter the street in the days following the earthquake, all abandoned due to sinkholes and liquefaction that flowed onto the street. Today marks a week since the earthquake struck Christchurch – the official toll currently stands at about 150, but police are estimating that it will rise to at least 240 – making this one of New Zealand’s worst disasters in history. I’m sure the headlines that have been making international news are decreasing, but the reality for Christchurch isn’t changing quite as fast. Dani and I were both home during the quake – I’d just returned from the CBD where I’d been visiting a client. I’d considered staying to catch up with a friend who works in Hereford St and having a coffee, but instead I changed my mind, because I was attempting to have a coffee-free day. Dani’s first day of Uni was on Monday, but she was without lectures on Tuesday due to the clinical practice schedule not starting to the following week. Dani retreated from her study to make lunch, and I joined her in the kitchen as the earthquake struck. 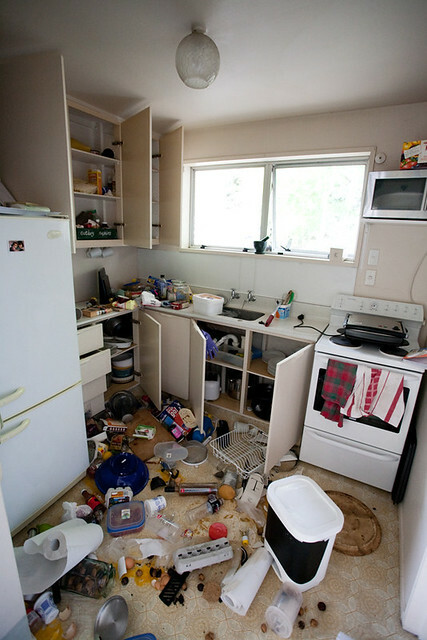 Our kitchen, where we were both standing during the quake. The house stank of a mixture of fish sauce and coffee. What began like any one of the 1000′s of aftershocks we’ve already experienced, became within half a second a force of nightmarish proportions. It’s hard to describe the experience, and I doubt anything I write would put it in perspective. To give you an indication of the forces at the time, I saw a picture in the newspaper of an ordinary coffee mug embedded in a wall. Dani pushed me under the archway out of our kitchen as the cupboards and fridge emptied themselves smashing everything on the floor. Without trying to sound melodramatic, nothing in my life had prepared me for the complete terror I felt in that moment. In those moments I felt minuscule – like if it shook any more the earth would rip open. Like this is a force I’ve never even dreamed possible. Like if she wanted to, Mother Earth would have no trouble dispatching the entire city forever. I found myself hyperventilating and in a state of shock. Dani sprang into action – I felt sick, and lightheaded. Leaving the front door of our flat we instantly saw the 80m cliffs behind the school in Redcliffs had left a huge cloud of dust after their collapse. We checked on our neighbors and ran to the school expecting to find it buried in rubble. Fortunately the kids had been evacuated to the field at the front of the school – we tried to calm groups of kids down with reassurance that they were safe. We hadn’t been there more than 30 seconds before a huge aftershock rolled through. The kids screamed in unison, and we watched in awe as the entire cliff band collapsed for a second time. This is an image I doubt I’ll ever forget. We checked on a few more friends and neighbors before returning to our flat – only then did we realise the extend of the mess. Dani’s bookcase had fallen and crushed the chair she would have been sitting at, if she’d still been in the study. Dani’s dresser in our room – which is not easy to move with two people – had also fallen over and emptied itself. I caught a glimpse of broken plaster board and then realised the entire bedroom wall had separated from the concrete block wall that separates our flat from the other. Miraculously all our windows remained unbroken. The concrete driveway that is shared by four units cracked into a hundred pieces. The asphalt at the head of the driveway became buckled and warped. The foundations of all the units are now separated from the driveway by at least an inch. Huge cracks near the sea wall in Redcliffs, on Beachville Road. Rumours of a rapidly receding tide (precursor for a tsunami) filtered down the street amazingly fast – the street was empty within a minute as everyone departed for higher ground. Thankfully this rumor didn’t eventuate into reality. The phone network was instantly overloaded, and it was impossible to get a call through. At this stage we hadn’t heard from any of Dani’s family, and Dani was beginning to get quite distressed. I rang Mum & Dad in Australia and was surprised to get the call through – needless to say I think I freaked Dad out when he answered the phone as all the emotion came rushing out. I was pleased I could tell him that we were safe before he and Mum heard the headlines. Christchurch has become quite familiar with earthquakes over the last 6 months, and everyone is very familiar with aftershocks and their related magnitudes on the Richter Scale. A neighbor said they’d heard the quake was only a 6.3 which considering our experience I found very hard to believe. 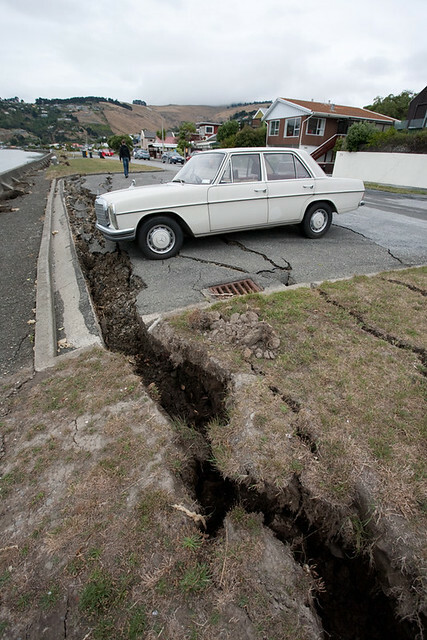 However, Redcliffs was less than 3km from the epicentre, and the quake was extremely shallow – less than 5km deep. In the September 2010 magnitude 7.1 earthquake we were more than 30km from the source. I’ve since heard that in the Sept 7.1 earthquake, peak ground acceleration in Christchurch was 0.8G. (G being the acceleration of gravity). The peak ground acceleration in Christchurch for the Feb 22nd 6.1 earthquake was as high as 2.2G in some places, but averaging around 1.5 to 1.7G. The scenes of devastation are discrete, but wide spread, and totally without discrimination. You can drive through areas of Christchurch where there is no evidence of an earthquake ever happening. Others are completely destroyed. The eastern suburbs (including Redcliffs and Sumner) were among those badly affected. Yesterday we participated in the Student Volunteer Army digging liquefaction silt. We visited one of cities poorest neighborhoods Aranui where the stinking liquefaction was up to a foot thick. We’ve since heard that in Avonside, the silt is found up to half a metre thick. Many of the roads are warped – sewer culverts and stormwater drains are thrust up through the surface, and craters left behind where liquefaction has left a void under the surface. We consider ourselves lucky in the extreme. Not a single member of Dani’s family was injured or killed (plus theres not a single member of my family in New Zealand). Every single one of our friends are accounted for, safe and well. Many people are displaced from homes, including us. We are currently living with Dani’s parents in St Albans. Our flat is probably livable except for the absence of running water – electricity was restored yesterday. We do need to have the concrete block wall evaluated before we would feel comfortable living there. Our landlord has kindly allowed us to hold our rent payments until we return. Many homes in our neighborhood are either evacuated because of the potential for rockfall, or because they are unsafe to live in. The CBD is ‘munted’ – current estimates suggest that as many as a third of all buildings within the four avenues will be demolished. My old office which was red-stickered in the boxing day aftershock has partially collapsed. The full recovery from this earthquake will not be months or even years, but possibly even decades. Current estimates for the recovery costs are now at $20billion. My first thoughts as the main earthquake faded was “How can we live here?”. If it happened twice, who’s to say it won’t happen again? It seems totally polar to all instincts of self-preservation to live in a city which can kill you in a wink. I guess we can take inspiration from other places of devastation – New Orleans, Kobe and closer to home, Napier. The community response is really inspiring, and its been great for my mental well being helping in the streets. Somehow I’ve managed to avoid having coffee since the day of the quake – I guess its hard to discern the caffeine withdrawals from the stress of earthquake life! Welcome to the brand new PXL.co.nz – now featuring more goodness. PXL is the home of me – Simon Waterhouse – Christchurch based Commercial photographer, graphic designer and web designer. This website started as an exercise in designing custom themes for WordPress, and has developed into my new company website. I’ll be adding new content all the time, so check back regularly, or even better, add this blog to your RSS reader.